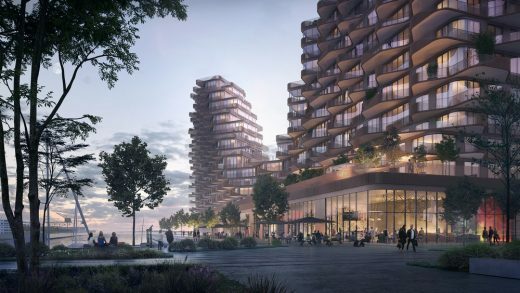 Anchoring the Eastern edge of the Bayside Development on Toronto’s Revitalized Waterfront, ’The Waves’ at Bayside is born out of its spectacular lakeside location. Its playful façade is a reflection of the waves across Lake Ontario. 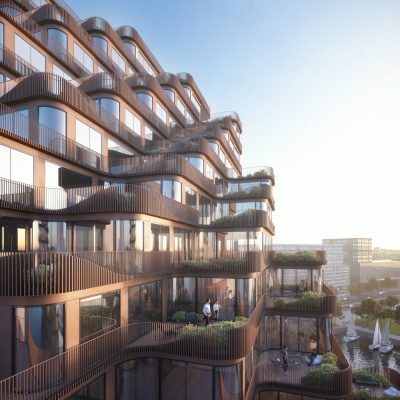 The building is 3XN’s second significant residential development on Toronto’s waterfront, located right next to the Copenhagen based firm’s first North American project; Aquabella. The unique aspects of the site constraints have been the primary driver behind the building design, massing, and terraces strategy. 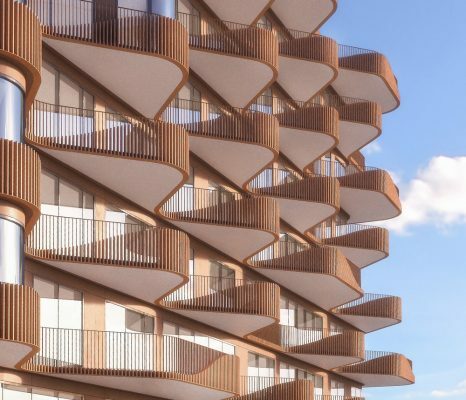 In anticipation of the DRP and City Approvals process, the building is positioned to be a good neighbor to the surrounding, respecting its views and sightlines. The building is shaped as a landscape with two high points and a valley in-between. 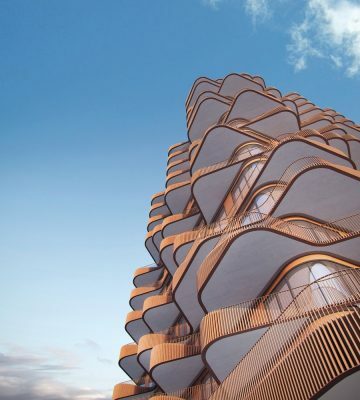 By shifting these two “peaks” slightly apart – 3XN was able to maximize waterfront views from each unit. As the building steps back on higher floors, a large percentage of the suites benefit from the steps becoming spacious terraces. Within the “valley” of the project, the building’s shared amenities are found; both indoor spaces such as community rooms, along with an expansive deck space with an outdoor pool. 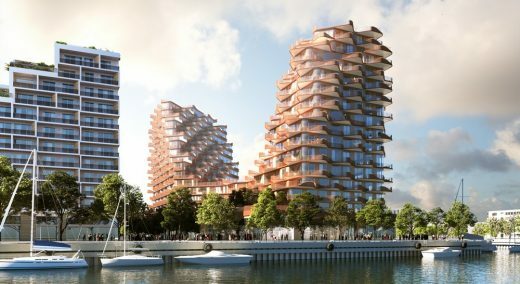 Toronto’s waterfront is undergoing tremendous change, and the Bayside development is a central role in its revitalisation. 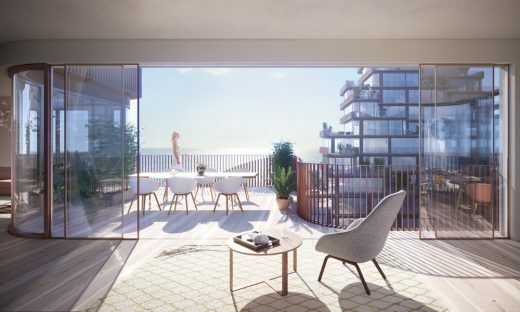 The podium of the building will have a continuous double height façade facing towards the promenade, with a through-block connection as an extension of Edgewater Drive. 3XN proposes various public functions (such as a rowing club) at the podium to activate the waterfront along with different restaurants and cafes. 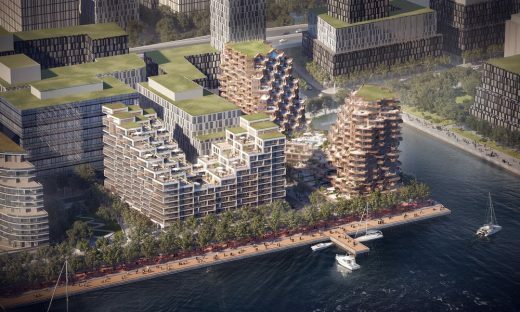 The activation of the waterside edge has been a central part of the design process, The Waves at Bayside should be beneficial for the residents and contribute to the betterment of the City of Toronto itself. 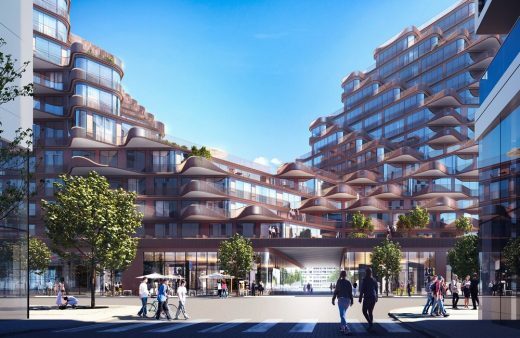 Waves at Bayside is located on the edge of Google’s parent company Alphabet’s newly announced smart community project named Quayside, driven by its subsidiary Sidewalk Labs. The community will span the entire 3,200,000 sqm (800-acre) waterfront area once completed. 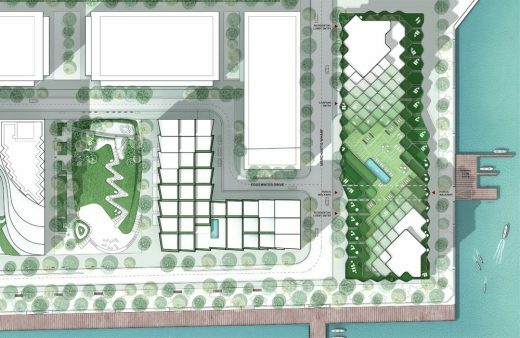 Sidewalk Labs and Waterfront Toronto have imagined a neighbourhood that would incorporate high-tech systems to help solve current city issues, like a lack of affordable housing, traffic congestion and safety, and environmental impact.